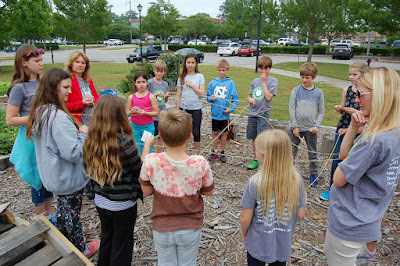 The Green LIONS Garden chased fellow classmates, made a yarn web and collaborated on answers posed as questions at our last couple of gatherings in a variety of games to weave all of the lessons they’ve learned this spring together. 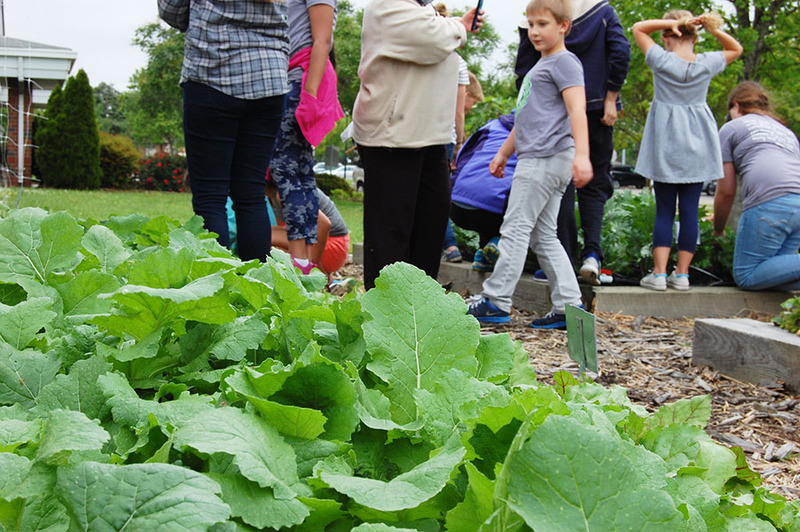 While we focus on sustainable gardening in our program, this subject would not be complete without tying it to the bigger community and world. If we can learn to not harm the environment in our gardening practices, find ways to utilize waste in the garden instead of disposing of it through methods like composting, and also fully enjoy the fresh, nutrient-rich produce—then we can learn to reduce our use of chemicals at home and at school, and reduce our own waste in our lives. We can go even further and begin sourcing what we don’t grow or make ourselves from local farmers and craftsman, reducing our carbon footprint through sourcing items close to home, and supporting our local community members and economy. First, they played an energetic game of Pollination Freeze Tag! 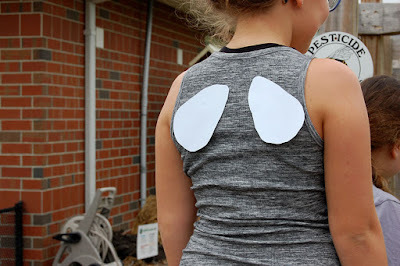 A handful of students were our honeybee pollinators with self-made wings taped to their backs. 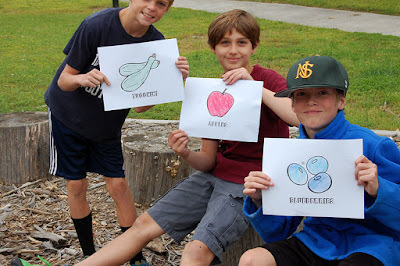 The rest were fruits and vegetables and held pieces of paper with a common fruit or vegetable pictured on one side and a flower on the other. In the center of the flower was taped a cotton ball—the flower’s pollen! The chase ensued. If a honeybee tagged a flower, the flower must freeze in place and give the honeybee its pollen cotton ball. If the honeybee already had a cotton ball in her possession she passed this on to the flower to “pollinate” her. Alternatively, the flower had to wait until a honeybee came back by to hand off a cotton ball to be pollinated. Once pollinated the paper with the flower picture was turned over to reveal the resulting fruit or vegetable. 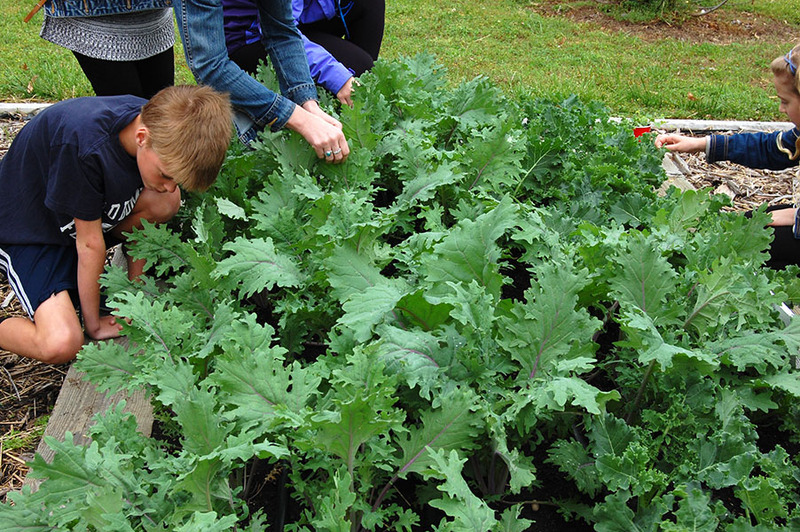 This helped students understand how important pollinators are to our food system. Next students discussed, in depth, ways we can reduce our waste in our own families. Did you know that the average American produces five pounds of trash a day? That is more for an individual than any other country in the world! We can do better. Students learned ways they can reuse items, or to use re-usable containers and water bottles for lunches and sports events. They explored different options to reduce waste when grocery shopping—like taking their own containers to fill from the bulk bin, using re-usable shopping bags and produce bags, and not choosing too many items packaged in plastic when possible. Students also learned how to conserve water and electricity through simple, mindful actions at home and at school—like turning off lights in rooms they aren’t occupying, turning off the water when washing their hands or brushing their teeth, or plugging the tub drain before turning on the water instead of waiting until the water is heated up. Conservation also refers to protecting our waterways. 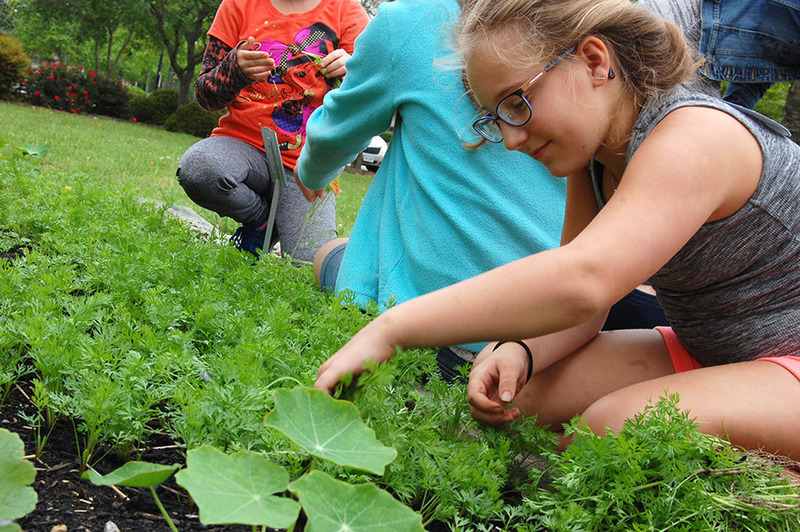 Choosing to not use chemicals on our lawns, not only helps the pollinators and other beneficial insects in our neighborhoods stay healthy, but it prevents chemical run-off into our watersheds which helps keep our waterways clean and marine life safe. We then had an eye-opening discussion about the importance of eating locally and how much this choice can favorably impact our environment. Local, small farms, even if they are not certified organic, generally use more biodiversity and more sustainable methods than industrial farms. When produce is recently harvested this is when it is not only fresher, but more delicious and nutritious. You can only find the freshest produce from locally grown sources. It is truly more value for your grocery dollars. Students explored all of the steps taken to bring a food item to our plate through a fun yarn weaving activity. We posed the scenario of making a pizza and needing pizza sauce. We went through 16 steps to create our web from planting the tomato, through its route of being made into sauce and packaged and finally landing on the shelf of your grocery store. Then we proposed the scenario of finding local tomatoes, herbs and garlic at a farmers’ market or your own garden and making your own sauce. We reduced our web to only three steps! Now that is a small carbon footprint. While convenience may be the easier route, taking some time to live in line with your environmental values makes a huge difference, and is entirely doable. 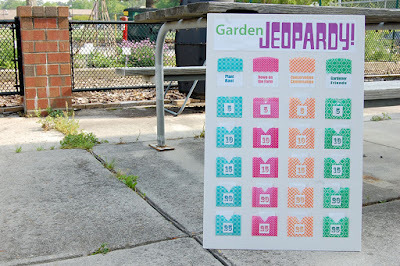 Finally we wrapped up our gaming adventure with an exciting game of Garden Jeopardy. 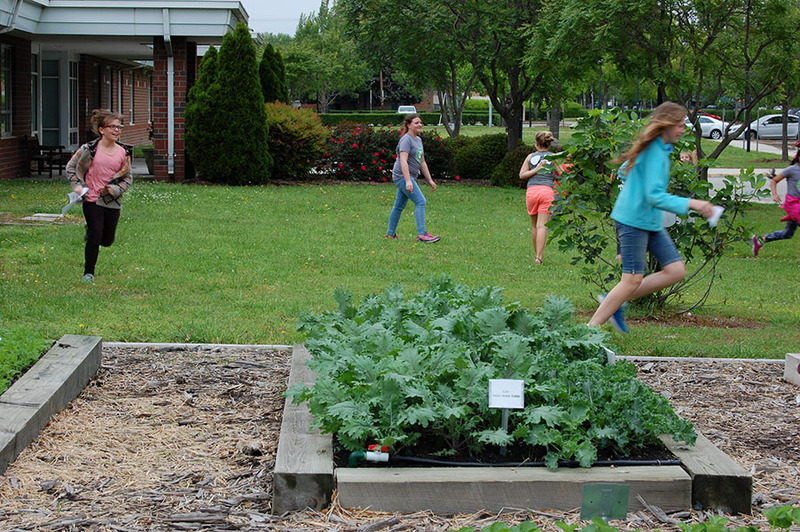 Students are challenged to questions about pests and beneficials, conservation methods, plants in the garden, and sustainable gardening and farming methods. Garden Jeopardy is a fun way to wrap up to see how all of these topics are interwoven. 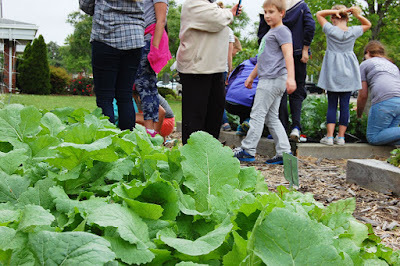 We will conclude our spring garden program with our Harvest Tasting in a couple of weeks so come back for pictures of the delicious dishes the students and parents create to celebrate our bountiful harvest! 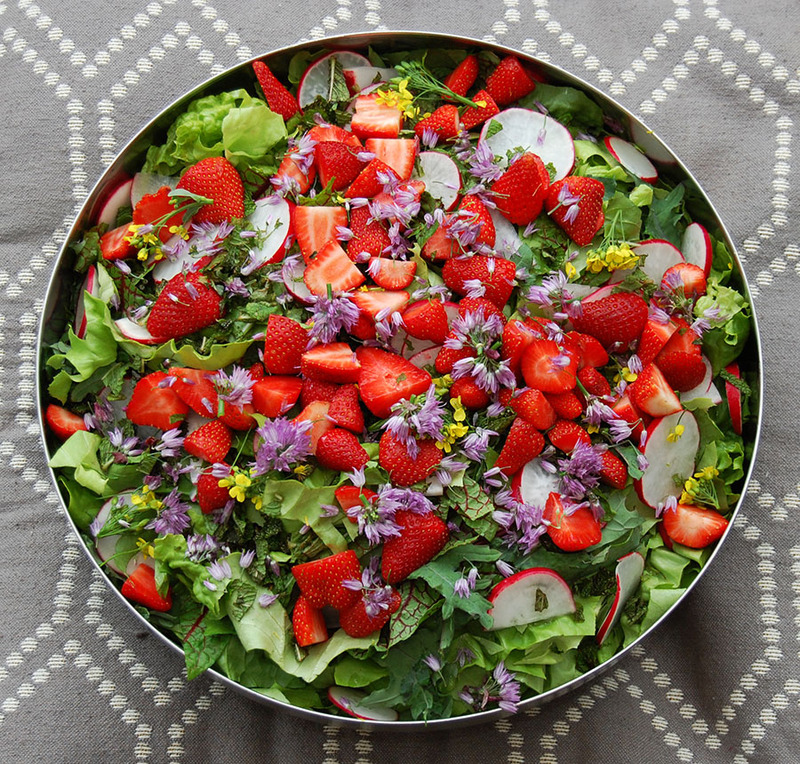 Here is a preview with this picture of the beautiful salad created for the Teacher Appreciation Luncheon entirely from the LIONS Garden.